Fergie performs the National Anthem during the NBA All-Star Game 2018 at Staples Center on February 18, 2018 in Los Angeles, California. The singer, who was largely lambasted across social media following her poorly received rendition of the Star Spangled Banner at the NBA All-Star Game, said she meant no ill will with her jazzy take in a statement to TMZ. Before the game, the singer slinked up to the microphone in a little black dress and gave a bluesy and somewhat unusual rendition of the national anthem that did not appear go over well with the A-list audience, or apparently the entire Internet. In clips, Chance the Rapper, Joel Embiid, Draymond Green and Jimmy Kimmel were spotted not really feeling Fergie's version before the game. One viewer, Isaac Harris, called it the "worst" national anthem he'd ever heard, writing, "Literally dying at these reactions. Fergie with the worst rendition ever." John Middlekauf simply tweeted, "Worst rendition ever?" The NBA announced the 2019 All-Star Game will be held in Charlotte, North Carolina. The 2017 All-Star Game was relocated from Charlotte to New Orleans, Louisiana, because of North Carolina's controversial "Bathroom Bill." @CoryTowns wrote, "LMAOOOOOOOOO FERGIE SOUND LIKE A BODEGA CAT." Some viewers are saying that the only thing worse than tonight's Fergalicious national anthem may be Roseanne Barr's headline-making, crotch-grabbing performance of the "Star-Spangled Banner" in 1990. Probably not a comparison that the eight-time Grammy winner will love. 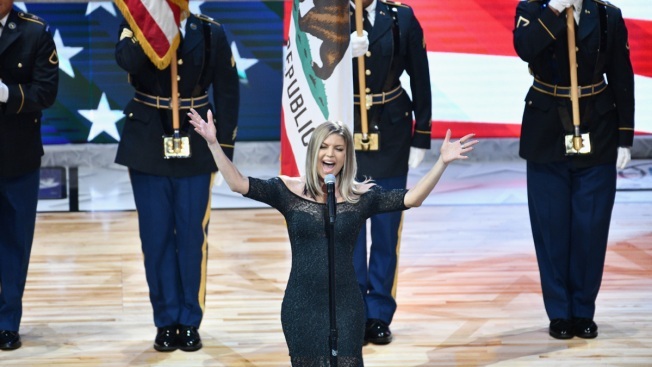 Not only did Fergie try to make the National Anthem sultry, she tried it, and failed. That's two offenses in one. Breaking News: Former Black-Eyed Peas singer Fergie was involved in a horrible train wreck today. I am watching the NBA All Star Game and I still can’t get over the awful version of the National Anthem that Fergie sang. Brutal. I agree with many who’ve said it. It sounded like a Sexual Healing version of the Star Spangled Banner. #Fergie managed to do the impossible....Black, white, young and old. No matter what your backround is, or your religious beliefs. Democrats and Republicans. We were all one. UNITED in the belief that she sang the worst version of the #NationalAnthem we have ever heard. What do you think of the Black Eyed Peas singer's soulful number?